FILE - President Donald Trump speaks about sanctuary cities with law enforcement officers in the Roosevelt Room of the White House, in Washington, March 20, 2018. On April 12, 2019, Trump said he was considering sending detained illegal migrants to sanctuary cities. He told reporters at the White House that his administration was "strongly looking at the possibly." Earlier Friday, he tweeted, "Due to the fact that Democrats are unwilling to change our very dangerous immigration laws, we are indeed, as reported, giving strong considerations to placing Illegal Immigrants in Sanctuary Cities." "The Radical Left always seems to have an Open Borders, Open Arms policy — so this should make them very happy!" he added. 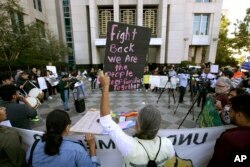 FILE - In this June 20, 2018, photo, protesters demonstrate outside the federal courthouse in Sacramento, Calif., where a judge heard arguments over the U.S. Justice Department's request to block three California laws that extend protections to people in the country illegally. Sacramento is a sanctuary city. A spokesman for the Department of Homeland Security said in a statement Friday: "At no time has the president indicated, asked, directed or pressured the acting secretary to do anything illegal. Nor would the Acting Secretary take actions that are not in accordance with our responsibility to enforce the law." In remarks to reporters Friday, Pelosi called the idea "unworthy of the presidency of the United States and disrespectful of the challenges that we face as a country, as a people, to address who we are — a nation of immigrants." Pelosi's hometown of San Francisco is a sanctuary city. FILE - Philadelphia Mayor Jim Kenney speaks during a news conference in Philadelphia, Nov. 15, 2017. 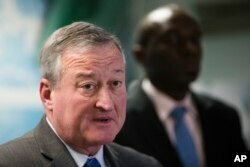 Philadelphia Mayor Jim Kenney said in a statement, "While the Trump administration's proposal shows their disdain to basic human dignity, the City (Philadelphia) would be prepared to welcome these immigrants just as we have embraced our immigrant communities for decades." Chicago Mayor Rahm Emanuel said, "We would welcome these migrants with open arms, just as we welcomed Syrian refugees, just as we welcomed Puerto Ricans displaced by Hurricane Maria and just as we welcome Rohingya refugees fleeing genocide in Myanmar."